Live Caribbean Stud Poker – With poker variants aplenty to play in the online casino world, you are spoilt for choice. If you’re looking for something away from the generic (if exciting) gameplay of hold’em poker, though; Live Caribbean Stud Poker could be for you. After all, few other live poker games can offer you a chance to place a side-bet which could see you win a progressive jackpot cash prize. Live Caribbean Stud Poker is a high-adrenaline game of table poker, brought to online casinos in live dealer format by Evolution Gaming. Various lower-level and uncapped progressive prizes are up for grabs with its main side-bet feature, and the gameplay is also far simpler than hold’em poker games. Variants are limited when it comes to this live casino game, although some optional side-bets do make the game more interesting than some of its counterparts and rival table poker titles. 5+1 Bonus Bet: One of Caribbean Stud Poker’s optional side-bet games is the 5+1 Bonus Bet. This bet is optional. By using their own five-cards plus the dealer’s single visible card, players are wagering whether they can land a poker hand. Only Three of a Kind or higher counts, but prizes can rise as high as 1,000:1. Progressive Caribbean Stud Poker: Arguably the selling point of the game is a progressive jackpot side-bet. This side-bet can be active (if you place one) no matter what the outcome of the base game happens to be. Progressive jackpot prizes keep on rising until a player lands a Royal Flush. However, lower-level prizes are available (for fixed prizes or a smaller share of the pot) when Three of a Kind, Straight, Flush, Full House, and Four of a Kind or Straight Flush hands are encountered with a side-bet. Keep in mind that not all Live Caribbean Stud Poker games offer the progressive bet, so this truly is a variant of the main game. – It is still not known if Caribbean Stud originates from Aruba or on a cruise-liner on it's way to Aruba. – Although most of the casino table-games date back from late 1800's or early 1900's Caribbean Stud first appeared only around 1980! 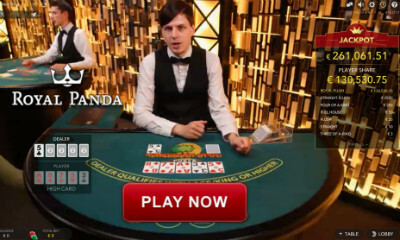 The main Live Caribbean Stud Poker game is streamed out of Riga, Latvia. It is played with just a single deck of cards. As mentioned, some variants incorporate the progressive jackpot side-bet, and others don’t, and some casinos offer both games.The 5+1 Bonus Bet option should be present in both games, though. 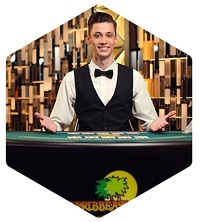 One of the perks of Evolution Gaming’s Live Caribbean Stud Poker game is that it is one of the few to be mobile-friendly. 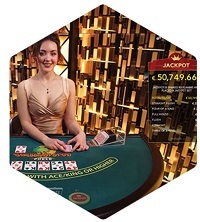 Although none of its cameras are adjustable (unlike other live casino games from this developer) players do still have options open to them, including flexible table limits, and dealer/player interaction. Live Caribbean Stud Poker is one of the simpler poker games you can play in live dealer format at online casinos. The only “insider knowledge” you really need to have is a good understanding of the hands in poker. Since most of you will already know how the hands are valued, getting to grips with this game should be a doddle. Here’s how to go about it. The Bet: Players must use their chips to place bets as in any other live table games. An ante bet must be placed in the relevant place on the table. That stake must fall within the table limits as specified in the game itself. If you wish to play for a progressive jackpot (that is, if your Live Caribbean Stud Poker game offers one), then you must also place that bet in the jackpot side-bet of the table). The Deal: The dealer offers all players a total of 5 cards. You are only playing against the dealer here, not any other players. No drawing or changing cards is permitted in this simple poker game. The Value of the Cards: The standard poker hands are in play in Live Caribbean Stud Poker. This means that players can potentially hold a Two Pair, Three of a Kind (not to be confused with “Three Card Poker“), Straight, Flush, Full House, Four of a Kind, Straight Flush or a Royal Flush in their hand. The Play: The dealer will turn over their first card, showing it to the players. Now that you have your cards, it is time to have a think about what poker hand you can create with them, if any at all. Based on your hand, you can choose to play (and double your original bet), or you can choose to fold, losing your stake in the process. Once your decision has been made, the dealer will turn over their remaining cards. The two hands (yours and the dealer’s hands) will then be compared. The highest-ranking hand will win. Of course, earlier we mentioned a jackpot side-bet. Some Live Caribbean Stud Poker games come with a progressive jackpot side-bet. These bets typically cost $1 to play. Depending on the hand you have, you may be entitled to a progressive prize, even if you lose the game. Straight Flushes typically pay 10% of the progressive prize, with royal flushes paying out the entire jackpot. Prizes for lower ranking hands vary from game to game. Evolution Gaming really is one of the only developers to deliver Caribbean Stud Poker as a live dealer game. If you aren’t a fan of what you see, you’re unlikely to find another developer producing such a game. Yes, if you land the progressive jackpot, you can pocket untold fortunes. However, you’ll need a Royal Flush to do it. You’ll no doubt be aware that the odds of landing a Royal Flush are slim at best. This may be something you wish to keep in mind. However, winning smaller, lower-level progressive sums with decent poker hands may be something that comes into play. The cost of a bonus bet is fixed at $1. It doesn’t matter whether it is the 5+1 Bonus Bet or the Progressive Jackpot side-bet. You will always end up wagering $1 a pop to try your hand at side-bets in Live Caribbean Stud Poker. Most live casino players flock to the hold’em tables, so the tables are not as busy as you might think. This is good because it guarantees you a seat. On the other hand, the fewer people who wager, the longer it takes for the progressive prize to reach big sums. That being said, the fewer people who play, the longer the progressive will remain unwon. 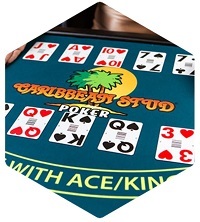 Live Caribbean Stud Poker is a game for those players who want to try something different. Keep in mind that it is a bit of a high variance table poker game; so, you could go through long periods without a win. However, when a win does occur, there is a chance that you’ll make up most of what you’ve lost, if not more. This mixed-bag of a game also provides additional excitement through its progressive side-bet, which may just sway your mind to give it a whirl.